how many gram of sugar? Hallo, first of all thanks for sharing all the wonderfull dishes but do you have the recipies in English coz I can't read Chinese. Just hop over to my English food blog here. You'll find some of my recipes translated in English. If you are over sea resident,you can find molds on ebay, search for moon cake mode. Dear Christine, 您好. 現時市街很流行用糕粉做餅皮,不用蒸餅皮, 很是方便, 您這班蘭葉冰皮月餅, 可以改用糕粉做, 省郤蒸粉漿這個工序嗎? I tried making it this weekend and they taste divinely delicious! Pandan leaf, green beans and coconut milk are the perfect combination. They taste so good that I'll totally be making it even it isn't Mid Autumn festival. I do have a very basic question. The glutinous dough was really sticky and impossible to work with bare hands (I didn't mind the heat as much). After a couple of trials, I used plastic cling wrap (since I don't have plastic gloves) which works well. Is using plastic gloves/cling wrap the only solution to avoid the dough sticking to my hands? Should the dough be so sticky? Thanks so much, Christine. I love all your recipes that I tried but especially *love* this one. When the dough is completely cooled down, it won't be too sticky at all. 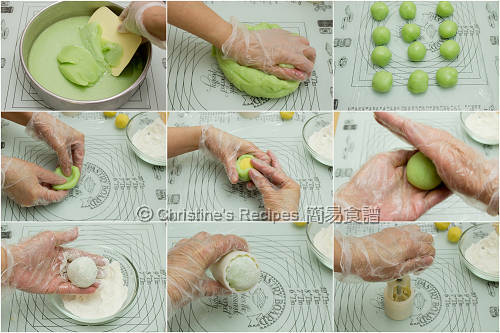 Yet I do recommend to wear plastic gloves, as the mooncakes will be eaten straight away after shaping, and it also helps keep longer. The plastic gloves not only keep your hands from sticking, but also keep the food clean. Thank you for sharing the recipe. They look so yummy and I can't wait to try before Moon festival. One question: my kids don't like the pandan favor, and I'd like to make strawberry and/or mango favor for them. Can you let me know what ingredients should I add to it? Thanks. Not quite get your question, sorry. Are you asking about what ingredients would go well with strawberry and mango? 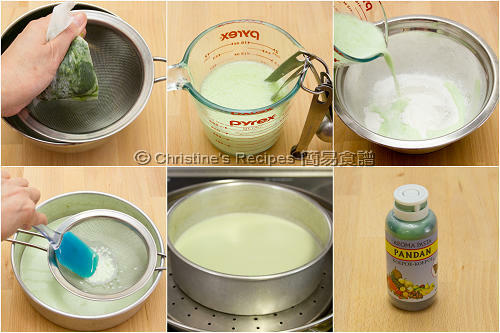 Or you want to know what ingredients can be used except pandan? I'd like to know how to make mango and strawberry favor for this snow skin moon cakes. e.g. can I use mango extract to substitute for pandan leaf juice and pandan extract? hi, thanks for yr recipe, i also successful to make it. But the skin taste like "moa chi",not sure do you have other recipe for show skin? Thanks. Got this one and this one here. Lucky to have your website referred. i figured it out it may be the best one which I have in my life! Thanks a lot for sharing your recipes with us. I'm living in Canada, can't find pandan leaves, so I used my home grown fig leaves instead. I also skip the condensed milk and coconut milk. The result of first try is pretty good. Fig leaves also give the green color and the taste is very match the green bean paste. The turn out favor just like the mung bean dessert soup with stinky herbs. 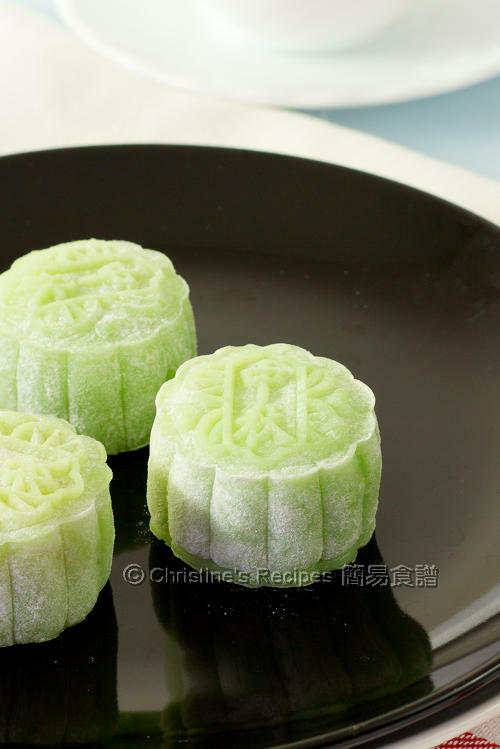 So glad to know that fig leaves can be used to make snow skin mooncakes. I made but seems not that smooth, why? Please help? Are you asking about the filling? Why not smooth? If mung beans are softened enough, cooked with sugar and oil in wok. They will turn very soft easily. In my recipe, I recommend to press the cooked mung beans through a sieve. It helps to get soft and smooth mung bean paste. Can you recall what went wrong when you cooked this filling? After I asked you yesterday and read your reply, I tried this recipe (without pandan essence) today. The dough from this recipe was so much softer and stickier. Couldn't wrap it with bare hands (definitely need cling wrap or gloves). I think this one is more for advancd learner, but the old recipe is much easier. This one does feel much softer in texture, but I think the old recipe resembles HK snowy mooncakes more. But it's good to have more choices. Agree, this one is much softer in texture than the previous one. 我的月餅模是100g. 應該買個50g 嗎? 如果不用. 份量應該怎樣算? I see the mooncake mould you are using is the one that you press on, would the wooden ones that doesn't have the push thing work too? No, the traditional wooden ones don't have the handle that helps you push out the mooncakes. Quite a challenge to use. What is 澄麵粉 in English? 澄麵粉 is wheat flour / wheat starch. 你的冰皮月餅食譜太棒了, 冰皮的質感一流!!! 我只是稍為將餡料改了一點, 變成一倍椰漿, 半糖, 1/3油. 家人和朋友吃過都說讚! 謝謝你! Christine, 我發現用月餅模的手掣推月餅出來的時候個月餅底會變圓, 好似不倒翁咁, 要自己再輕輕壓平. 唔知你有冇呢個問題呢? 還是是我的技巧不夠好呢? So glad that your family and friends liked these mooncakes. Same to you. Happy mid-autumn festival !